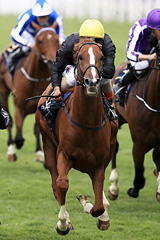 The John Gosden-trained Stradivarius set up a tilt at the St Leger at Doncaster in September with a gutsy victory. Ridden by Andrea Atzeni, the three-year-old son of Sea The Stars came with a withering run in the home straight and after hitting the front inside the final furlong, responded well to Atzeni's urgings to score by a neck from Ralph Beckett's Count Octave in second. The well-backed 11/2 shot was a fine second at Chester last time and Newmarket handler Gosden, registering his 43rd victory at the Royal Meeting and second success of the week, felt the chestnut colt had learnt plenty from that run. He said: "It did get quite tight at the bend on the first circuit and it got a bit rough. He has run great, he got a beautiful ride and managed to get from stall 9 to the rail before getting through a gap at the end. "I've always said, if you run round Chester it is like having three races so you learn a lot and he is still learning and still green. "There is not a lot of him and I didn't want to give him another run between Chester and Ascot as I wanted to come here fresh and the plan has worked." Gosden immediately suggested that the St Leger would be the target for the colt, who is an 10/1 chance for the Classic on Town Moor with Coral. Gosden continued: "He has run a grand race getting through at the end and he has enjoyed it. He enjoyed the distance and all being well, we will point him to the St Leger. "I think he might just have one more run before the St Leger. I want to keep him fresh and he is a light-framed horse. "He doesn't need over-racing so he can just have a prep run and then go." Jockey Andrea Atzeni gets his first winner of the Royal week aboard Stradivarius in the mile and six furlongs G2 Queen's Vase. "Stradivarius travelled very well into the race," reported Atzeni. "The horse is still learning, he hasn't got much experience, and in fact was hanging into the rail most of the way. I had to go for the inside as he was hanging that direction. "There was half a gap to go through and the horse went through well, he was very good to go through and he was always going to win his race. "He will get better as the year goes on as he is still learning, and is an immature horse. "It rode like a nice race, and we went a nice gallop. It had been a bad week up to this winner." This was a second Royal Ascot victory for the rider who got off the mark on Cursory Glance in the 2014 Albany Stakes. Count Octave, trained by Andrew Balding and ridden by Oisin Murphy, was a neck behind in second. The colt began the season with a win at Wolverhampton, following up with a fifth in the Chester Vase before coming to Royal Ascot for this 1m 6f race. Balding enthused: "We're delighted. Obviously this is only his fourth career start so he's still learning. He's a horse for the future really, a lovely stayer going forward. He might just be a Leger horse this year - we were just debating because he wouldn't want the ground too soft. He's a top of the ground horse." Balding explained that the Voltigeur could be the next target for Qatar Racing's Frankel colt: "I think York would suit him very well as a track. Obviously we've got to discuss it with Sheikh Fahad but to me it would be the obvious place for him." Murphy said: "He travelled round like he was the winner and Andrew's done a great job preparing him for the race and he just got worn out of it in the last 100 yards. But he stayed on to the line and there's more horse to come." Secret Advisor, the Charlie Appleby-trained Dubawi colt pleased his trainer with solid third. Appleby commented: "I am delighted with that. "We always felt that this horse would improve with stepping up in trip. We weren't intending to come for this race but had gone for the King George V Handicap but didn't get in. "He is a nice horse for the future. This is only the fourth race of his career and he should improve more. "Staying is going to be his game, that is what he is bred to do." Jockey of the 10/1 chance, William Buick, added "It was a good run. He wasn't really travelling early on so I had to settle at the back. They didn't go a great gallop. He made up great ground at the end and is one for the future."